If aficionados of writing and writers wonder how what was once an audacious breakthrough for journalism became the standard which dominates the writing trade, they need look no further than the rise of one preternaturally talented journalist. In his time he became the very embodiment of that curious mix of news, gossip, literature, whimsy and other flavors called journalism. It takes a dedication above and beyond the call of duty to write the way Tom Wolfe did. Was there anything Mr. Wolfe could not transform from brass into gold? It is hard to think of a precedent for his dizzying ride to fame, fortune and sheer achievement, though other names come to mind. Like that of John O'Hara, another chronicler of his roller-coaster times. He, too, made all the minute details of first doing the research and then bringing the final product to a bright sheen look easy -- the most natural thing in the world. When actually it took unnatural devotion to his art, craft and obsession. The page of Arkansas' Newspaper that carried his obituary needed to bordered not in black but in all the colors of the rainbow, for he was that kind of writer, setting off fireworks whenever he sat down to type. Now he's dead at 88, for nothing could stop this gentleman writer. R.I.P., though it's hard to imagine him gone, he was such a whirlwind of essays, novels and literary works in general. There was no subject on which he did not provoke, often enough turning conventional assumptions on their heads. For he was not only a retailer of ideas and anecdotes, but their original source. 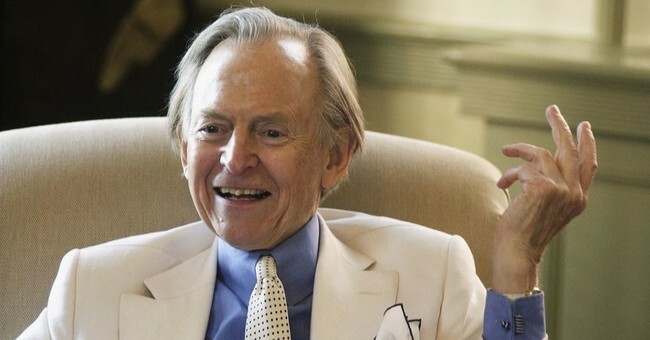 Tom Wolfe's was not a single style but many. Though each and every one of his styles was singular. It won't do to say he was a type, for he switched types as readily as he did suits, all of which were the height of fashion, just as he is now in journalistic circles even in fond memoir. Mr. Wolfe might have teamed up with other iconoclastic writers, but there was never any doubt about who was the general manager, shining star and resident scholar of the show. And what a show it was, whether he was collaborating with Hunter S. Thompson in another display of gonzo journalism or going it alone. The reader of small quality magazines, of which there used to be a plethora, soon came to rely on his byline the way shoppers out to buy silver soon came to look for the small indentation on each piece that read Sterling. For there's no arguing with quality or its insignia, which in this case was the byline Tom Wolfe. "The idea here (in the all-enclosing fraternity) seemed to be that a man should have the ability to go up in a hurtling piece of machinery and put his hide on the line and then have the moxie, the reflexes, the experience, the coolness, to put it back in the last yawning moment -- and then to go up again the next day ... and ultimately, in its best expression, do so in a cause that means something to thousands, to a people, a nation, to humanity, to God." How much better than unstinting praise of heroes is the measured kind that moves in concentric circles on these voyagers who go where no man has gone before. Maybe that's close to what it means to be an astronaut. And even closer to what it means to be a writer per excellence -- like Tom Wolfe. For in the new journalism, he set his compass and took off ad astra -- to the stars.